Ten Essential Kitchen Gadgets You Can’t Live Without in Mexico – What's for dinner, Doc? Seeing double? No, it’s me not you. I’m growing my new blog at MyBajaKitchen but it’s lonely over there so I thought I’d post on both blogs (or maybe you do need your eyes checked) 🤔 to entice you to come visit me! 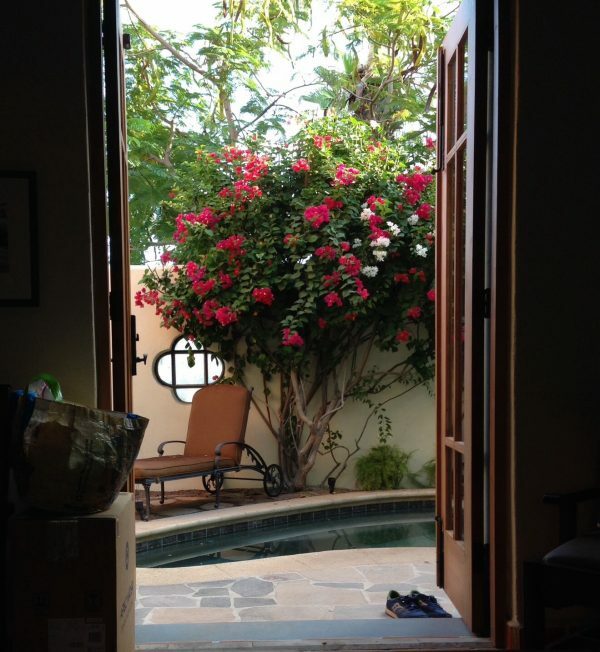 I’m writing recipes and stories from my expat life in Baja, Mexico, Nevada and California. Come by and say Hi. Muchas gracias amigas. Here’s the view from my kitchen in Mexico. Every chef or home cook has a list of essentials kitchen gadgets that they can’t live without and these are ten of my favorite kitchen tools that make my life easier. Of course I could make do with a knife, a cutting board and fire but why would I, when I can have these gadgets? I purchased my casa in Loreto Bay completely furnished with a well appointed kitchen but I struggled to find the kitchen tools that I use every day. I had taken photos of the contents in every draw and cabinet so when I moved in I would know what I needed to bring back to the Baja. I highly recommend this for anyone who buys a furnished home. It is an easy way to have a visual inventory of your new home. Loreto is a small Baja, Mexican town so I wouldn’t expect to find specialty American kitchen gadgets. You can drive to a larger city like La Paz or Cabo San Lucas to shop, order from Amazon.Mx or bring your gadgets from the U.S. or Canada. Here’s my top ten list of essential kitchen gadgets. This post contains affiliate links to Amazon because I like their photos, I can order from Amazon in Mexico and if you buy something I get a few cents. A chef’s knife, a boning knife and a small paring knife are the most basic knives that every home cook needs. I use my chef’s knife every day to chop onions, garlic and an abundance of fresh fruits and vegetables. The cuts of meat and fish you can buy at the open market won’t come neatly packaged in cuts that you recognize. Use your boning knife to remove the tendons and fascia left behind by the butcher and for filleting and scaling fish. The paring knife is essential for peeling melons, mangos, oranges and other fruits. I use the paring knife to devein and peel fresh shrimp. There’s no need for any fancy seafood tool. Keep your knives sharp! I travel with my Wüsthof knives even while on vacation if I plan to cook. A high end zester makes fast work of zesting limes, oranges, lemons and finely grates ginger for marinades, desserts or cocktails. Use it to grate hard cheeses such as parmesan or aged cotija. Purchase a larger stand up grater for cheese and vegetables, which you will find at most markets. Hello margaritas and mojitos. Lime and orange juice make tasty marinades, salad dressings, desserts and cocktails. Find a squeezer that has two sizes or get a large one for oranges and a smaller one for limes. I love this one. I eat greens every day and food safety is a concern in every country so triple wash all lettuces and greens in filtered water before eating them. A spinner makes the task easier. Mexican meats can be lean and tough so I commonly braise beef and pork with vegetables, some acid or wine and lots of seasonings. Pinto beans are easily left to cook all day in a slow cooker without having to watch the pot boil. The slow cooker lets me set it and forget it. More time for kayaking or paddle boarding! I use a pressure cooker less frequently but it works well for a quick method to tenderize meats in stews and soups. It quickly steams artichokes, potatoes and other longer cooking vegetables. I use my grill basket most days to roast potatoes, jalapeño poppers, sweet potatoes, shrimp or fish. It keeps the food contained and allows for easy tossing. Small pieces of shrimp and fish won’t fall through the grates. Think about tossing all of your kabob ingredients in the grill pan and forget the tedious chore of making and turning kabobs. Also you can put longer cooking ingredients in first, followed by fast cooking shrimp or fish. Everything will be cooked and ready together. I use it as a baking dish as well for zucchini boats and enchiladas. I avoid disposable plastic bags whenever possible because they end up in the ocean and of course fill our landfills. There is scientific support for avoiding plastic storage containers and strong evidence to never cook or reheat in plastic. Find glass storage bowls and containers in multiple sizes with lids for storing leftovers or for flour and sugar. Large canning jars would be ideal for storing dried goods. I did find glass containers in La Paz but I brought more with me. Probably not essential if you have sharp knives but sometimes I just want to make a smooth hummus or quickly dice veggies to add to taco meat or soups where the dice size isn’t critical. You can use it to grind small amounts of meat and make pastry doughs. Definitely a time saver! I bought this inexpensive one and I swear it works as well as my expensive Cuisinart. I am so excited to be grinding my own meat. I like to know what is in my food. I don’t want to think about chicken beaks or pig snouts in my ground meats. Make your own lean chorizo without soy and lard. I haven’t found ground chicken in my market so grinding it myself is ideal. You could make an all sirloin low fat burger without any scary ingredients. I admit that grinding meat is time consuming but I do it in large batches and freeze it in 1-2 pound packages. I bought this electric grinder but I have seen hand crank grinders at the Sunday market so I’m guessing that my Mexican neighbors want to know what’s in their meat also. The cost savings are incredible if you buy a whole chicken or an inexpensive lean cut of beef or pork to grind versus buying your meat already processed. There is strong evidence that the risk of bacterial contamination increases with the amount of processing your meat goes through i.e. cutting and grinding. I drink two lattes every morning before I speak or write a word. My family knows this and silence is expected until at least the first cup is consumed. Ya, I’m not really kidding. If you have a coffee addiction then bring your favorite coffee making equipment with you; a grinder, milk frother, French press, Keurig with reusable cups; anything that makes your morning coffee ritual possible. I have been know to bride friends and family to bring coffee beans with them in their suitcases but I did find a good dark roast whole bean coffee at the Pescador in Loreto. When it matters, its worth the search to find good substitutes for the foods you crave. Name a gadget that you can’t live without in your kitchen? Many of you have followed me to http://www.MyBajaKitchen.com but if not then please subscribe to my email list for more recipes and stories from my expat life in Baja, Mexico. Leave me a comment and I’ll add you to My Baja Kitchen’s email list of posts. No spam, no ma’am ever. Next Post I Stopped Cooking In Aluminum Foil, Should You?